Last weekend, I had the great joy of a weekend away with my sister and her wife and my brother's wife, at a fancy schmancy spa. We spent our time laughing and eating and dancing and lounging. We hydrated the connective tissue of our spines; we practiced NIA; we took an African drumming class. Some of us did athletic things like Tabata and kick boxing; one of us went outside and went snowshoeing. We were buffed and rubbed and oiled and wrapped; we luxoriated in the dry sauna and inhaled in the steam room and soaked in the hot tubs, naked because we've finally shed our modesty as more cumbersome than necessary. We tried water aerobics with a side of in-pool yoga, we tried restorative yoga complete with Tibetan singing bowls vibrating against our hips. And when we weren't spa-ing, we sat in the room with the view and fireplace and read books and did crosswords and drank strong black coffee and fruity herbal tea. The day we arrived, there was a jigsaw puzzle on a green felt table near the fireplace, complete. My sister and I looked at it, and looked at one another, and looked at it again, and took it apart. Surely it was time to for us to (re)start the puzzle. And what a puzzle it was. No ordinary cardboard puzzle this, it was made from meticulously cut plywood, about a half centimeter thick. The pieces slipped together with precision, it wasn't a rectangle, and the whole puzzle was embued with a sense of wit. 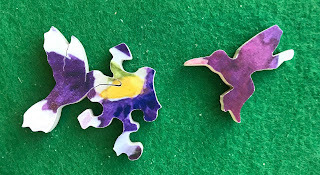 A piece shaped liked a hummingbird fit its beak into the yellow center of a flower. A piece cut into a pair of cherries hides in the cherries of the puzzle image. Other guests joined in - we’d come back past after a meal and find a few more bits snugged together. The singing bowl lady took full credit for having suggested the puzzle - “they used to have these crappy cardboard puzzles, I told them they needed an upgrade”. And there is no question that this precise and lovely wooden puzzle is an upgrade from your run-of-the-mill jigsaw. Discreetly tucked next to the puzzle was a little pile of promotional materials - from that we learned that the puzzle come from a company called Stave. And the prices? BREATHTAKING. Honestly, there are puzzles on their website that cost as much as a small car. This is seriously crazy. The best analogy I can muster is that they are to regular puzzles what flying in a private jet is to the sardine tin ignominy of commercial coach. Both ways are going to get you to Chicago, but do you really want to spend scads of money on the luxe leather-lined jet that takes off on your schedule? Yeah, I didn’t think so. It was a fun diversion though, given that it wasn’t my dime. And an amazing puzzle. something to bring people together (even if separately) and make you think.